Amazon has a great reading platform in the Kindle, but sometimes it's not enough. Sometimes I need to take the notes I make in a Kindle ebook and use them elsewhere. Amazon doesn't make it easy for us to do that, but luckily there are other ways. Back in 2015 I needed to export my Kindle notes, so I did some digging and rounded up a few tools which would help me do just that. The tools range from the simple (copy+paste from a web browser) to the inaccessible (an iPhone app and a Mac-only script). Now it's March 2019, and about half the tools mentioned in the original post are gone. So I have updated the post with corrected info and I've also pruned the tools that have died in the past four years. The available tools have changed a lot over the years. For example, Amazon used to have a site called Kindle.Amazon.com where you could find your note and highlights, see what other people were writing in the margins, etc. Unfortunately, that is gone now. That page was sorta replaced by Read.amazon.com, but not really. The new page won't let you access all of your notes, and there's no export option, so it's not really that useful for our current goal. Edit: The above statement might not be true. I am double checking. So let's start with the simple trick that still works. Look in the documents folder of your E-ink Kindle and you'll see a file named myclippings.txt. This is a text file of all of the notes and highlights made on your Kindle (but not on the other Kindles or Kindle apps on your account). You can copy this folder to your PC and open it. Boom. You can now copy and past your notes into other documents, emails, etc. Did you know you can have your Kindle email your annotations to you? (I didn't until Tom told me.) Amazon will email the notes and highlights to the address on your Amazon account. They will arrive as a PDF and a CSV attached to the email. You can access the export option from the Notes menu which can be found in the 3 dot menu dropdown inside the ebook you're reading. The Kindle apps for iOS and Android have a feature which is also not shared by the Kindle Fire tablets. They have a notebook menu where you can find all of the highlights and notes for an ebook. The notebook menu can be accessed from inside a book, but the way you find it differs between Android, iOS, and the Kindle Fire. On iOS, click the “sheet of paper” icon in the upper right corner. The export button is in the upper right corner of the notebook menu. The exported notes don't look very good, but this trick does let you pull the notes out of even a side-loaded ebook. On Android, click the "3 dots" icon in the upper right corner, and then select the Notebook option from the dropdown menu. 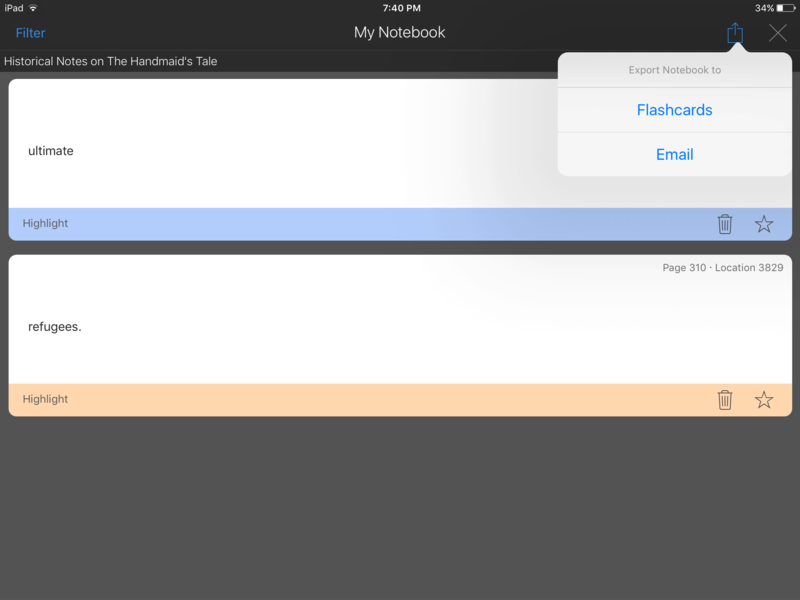 You can either create flashcards or export the notes to Drive, by email, or by Android Beam. On the Kindle Fire, open the ebook and press the center of the screen. One of the icons you will see across the top of the screen will look like a piece of paper. That is the notebook menu, and the export option is in the upper right corner. This nifty little bookmarklet is simple and works great with Chrome. After you install it, you use it be opening one an ebook's highlights page on Read.amazon.com and then clicking the bookmarklet button. I liked Bookcision because it worked well with Chrome. With other web browsers, you can save the notes to the clipboard, but with Chrome I also get multiple download options (text, XML, JSON). The latter two options include a link to the note's location in the ebook. When I first published this post, Notescraper was an Apple Script based tool which basically did the same thing as Bookcision. It copied the notes from a book's highlights page on Kindle.amazon.com and created local file on your Mac. But it's now 2019, and I don't know whether this script will work just as well on Read.Amazon.com, but I am including it just in case it still works. There are a couple versions of the Notescraper tool, including one which works with Evernote. But since I don't have a Mac, I can't comment on how well it works. 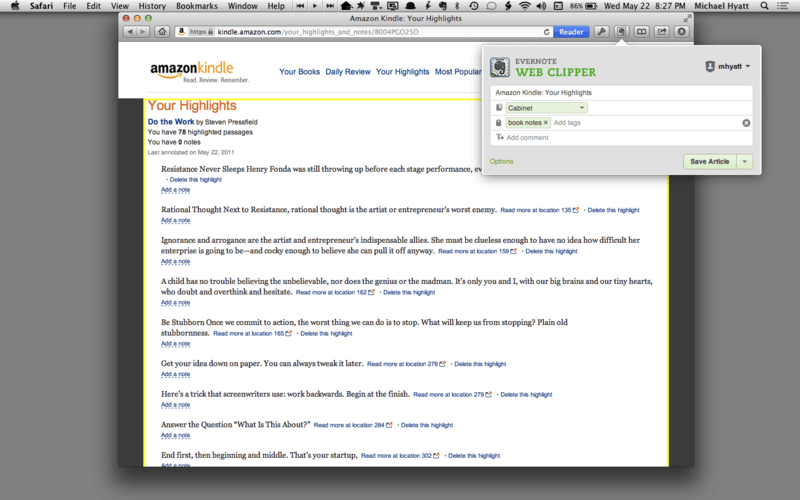 Speaking of Evernote, its webclipping can be used to import your notes and highlights. This tool can be used to copy part of a page or an entire webpage into your Evernote account, and I'm told it works well to copy notes from a book's highlights page on Read.amazon.com. But you might want to manually select the book notes though and copy and paste. There's one report that the page has an infinite scroll built-in that messes up one user's Evernote clipper. And while we're on the topic, Microsoft's OneNote has a similar clipping tool. It takes screenshots so it's not nearly as useful, but if you already use that platform then it's worth a look. Here's another service I'm not sure I can recommend. Clippings.io is supposed to offer an easy to use online service for managing your Kindle notes and highlights, but I haven't found a good reason to continue using it. While I was setting it up, I noticed that this "free" service works with a Chrome plugin which costs $2 (you can also find the myclippings.txt file and upload it). That turned me off, and since it basically duplicates activities I already perform on my PC, I plan to close the tab and forget about it. And last but not least, calibre. This ebook library tool can not only send ebooks to your Kindle, it can also fetch the annotations from a Kindle - only there's a catch. This only works when you have your Kindle plugged into your PC over USB. And it apparently doesn't work for newer Kindles. I found this trick while researching this post, and I also found a bug report which says that this feature doesn't work with newer Kindles. I can't get it to work with my Paperwhites, for example. But since it might work for you, I'm including it here. Head on over to JetShred for instructions and more details. All in all, there are a lot of tools out there that either don't work, aren't terribly useful, or are intended to work in only specific circumstances. But I found at least one tool that I like, so I'm good. Did you find one you could use? Did I miss one? Nice try, but not quite. Works on Keyboard but not Paperwhite or Voyage, where there’s a myclippings.sdr folder that’s shown as empty. I had my KPW (2013) sitting next to me when I wrote that. It had the myclippings.txt file. It was actually “my clippings.txt”, but the file is present. Not on mine. Nor my Voyage. I see the file on both my KPW and Voyage. It’s strange that you’re not, William. I use my tablet and kindle for reading, and the tablet for web/maps/apps too, but when I’m doing research I take notes on scratch paper or I do all the work on a real computer. When I’m reading I am doing it TO READ, not for research. When I’m researching I’m either handwriting notes on paper/index card to juggle concepts or I’m cutting and pasting to do the same thing. Neither works for me in my reader or tablet, not at all as handy as on a computer. I don’t mark up books either, because I grew up reading library books where writing in the text or the margins was vandalism. So what do you make notes for? Why mark up/make notes in a reader? Honestly? I mainly just use it to read. When I want to take notes or copy text, I open the ebook in an app on my laptop, and take notes in another app. As you say, the keyboard is much easier to work with than a touchscreen. But sometimes I do take notes in the ebook – when I’m proofreading an ebook, for example. I love being able to highlight text, especially for a book I plan to review, but also just to make note of things when I read. It’s very easy to copy and paste from the highlights area you mention, just using a web broswer. That works great, so long as the book is one I got from Amazon. If I get a book from another source, like Smashwords or Project Gutenberg, and sideload it to my Kindle, or if I send one of my own manuscrpts to my Kindle, then the software treats those items as “Personal Documents” and any highlighting or notes I make are NOT included in the highlights area on the web. It is annoying as hell! I know I could use the myclippings file, but that is more work! I can see why they don’t offer the same feature for randown Word documents, but a properly formatted ebook with the correct metadata should be treated as a book, and not a personal document. Do you know if Amazon has any plans to change this, Nate? I don’t know, sorry. I would have thought that the annotations would be accessible through Kindle.Amazon.com, but they’re not. I created a python script to format the My Clippings.txt file – it organizes all your notes/highlights into a seperate text document for each book, and formats the quote/note so it looks more presentable than how it is in My Clippings.txt. When you download it, just place Kindle Clippings Parser V1.py into the same directory as your My Clippings.txt. Then open your terminal app (in Mac, hold Command and hit the spacebar, then type “terminal” and select the Terminal application that comes up). type “python ./”, hit space, and then drag and drop Kindle Clippings Parser V1.py into the terminal, and hit enter. That should run the program, and you should see one file of highlights/notes created per book. Hi Nathan, that sounds pretty cool! However, the link is not there anymore, could you please post it again? Can that script also get bookmarks per book? If not, do you have a script that does that? I’d be super grateful! Invaluable! Thanks Nate, am saving this for reference. I rather think the simplest option is the one in the attached image. There’s nothing quite so easy, flexible and kinaesthetically satisfying as scribbling down half formed thoughts or keywords, then doodling a few connecting lines between linked concepts, perhaps adding an explanatory diagram or sketching a small image to serve as an aide memoir. I don’t make notes digitally. I read source text digitally and while I’m doing it, my hand is moving with a mind of its own across a primitive sheet of cellulose, making notes a very human way that no technology has yet managed to improve upon. The highlighting function is invaluable for any serious research use of Kindle books, and a major reason why I like Kindle. (A major pain is the Kindle books that don’t have real page numbers). I often finish a book with hundreds of highlights. Better than a print book with hundreds of tape flags, not to say cheaper. Notes not so much, at least for me. Your suggestions are very helpful. Are there enough research sources in your field that are in Kindle format? I work in contract archaeology, where reports and sources are gradually being scanned into pdf, but there’s nothing much useful in Kindle format. today I published my new developed tool for viewing and finding of kindle notes. The app is available at http://www.yups-blog.de for free. I can’t believe you dissed Clippings.io?? Their chrome extension saves so much time, and well worth the price if you are importing your notes on a daily basis. It costs money, and there are free alternatives. They all seem restricted to kindle.amazon.com – won’t work for kindle.amazon.com.au which we are obliged to use in Australia. Any suggestions? I refer to the main Kindle site in this post but I can’t tell you whether the tools will work elsewhere. Have you tried the tools? I would think Evernote would work, and Bookcision doesn’t show any code that mentions Kindle.Amazon.com. All of no use if you didn’t buy the book through amazon, apparently. I (proof)read writings of unpublished / amateur authors on a cooperation website but sitting at a computer to do that is not much fun. I want to read on a book-like device and the kindle app is perfect for that. So I annotate on the kindle itself, because 99% of my notes are just highlighting of the text itself, I don’t need to write out my corrections at that point. So the standard procedure is to download the PDF or EPUB version of the document (or highlight/copy/paste from the website into Word), then upload to kindle via http://sendepubtokindle.com, a free service that works amazingly well. Sadly there doesn’t seem to be a way to get the annotations made for documents like this. So, great to make the notes without having to chop down the Amazonian rain forest, but it looks like I still have to transcribe my notes by “10-finger interface” after I’ve finished reading. Such a waste of time and effort – the bits are already in electronic format, but now they have to go through an analogue meat connection to get back into electronic format again. You’re right. I just tried a book I loaded via send-to-kindle, and I couldn’t get at the notes. While we’re on the topic, what device are you using to proofread? If you’re using a Kindle, you should be able to get the highlights from the “myclippings.txt” file on the Kindle itself. I don’t have an actual Kindle – I’m using the app on an iPad. I haven’t tried accessing the files on it, but I seem to remember the last time I did look at the iPad as a USB drive all I could see was the DCIM folder containing my photo roll. Thanks for making me go look for a solution; I found one. The Kindle iOS app has a special notebook menu for your annotations, and that menu has an export option where you can email the notebook to yourself. The notebook menu can be accessed from inside a book; click the “sheet of paper” icon in the upper right corner. The export button is in the upper right corner of the notebook menu. I looked all over but could not find the export option you’re talking about. I clicked on the “sheet of paper” icon, but I believe it’s not in the upper right corner, but in the bottom right, just above the reading progress bar on iPhone Kindle apps, correct? Once I click on this “sheet of paper” icon, I see all my previous highlights with options to star, delete, and jump to location. But I see no option for exporting. Where did you find this option to export by email? I think we may have identified a difference between the Kindle iPad and iPhone apps. As you can see in the following screenshot, the Kindle iPad app has an option to export notes as either email or flashcards. Maaaaaannn, I feel so stoopid. I looked at that button (export, which I have always thought of as “send to”) more than once today while looking at how to create the notes… and overlooked it every time. Thanks Nate. Sometimes it just takes a fresh(er) pair of eyes. Or maybe a less angily frustrated pair. That’s the curse of universal design elements. If you see something in all the apps then you forget to check if you can use it. It seems that even on the iPad Kindle 4.17 this is only available for SOME books, mostly textbooks. Great! I’m glad it worked for you! I would like to report that the export highlights feature is now accessible in android. I downloaded the kindle app for android this morning and was surprised to see a ‘Export Notebook options ‘ on the top right corner. This works for personal docs and side-loaded books. I have a friend who beta reads for me. She reads the book on her iPhone Kindle app, making notes along the way, and when the time comes, she screenshots each of her notes and puts them into Evernote, sharing the note with me. It works. My paperwhite, up to day as of april 2016, has a My Clippings.txt folder that has everything in it. The My Clippings folder is empty, but the text file is full. kindle.amazon.com and Bookcision seem to work fine even for non-US users. I am buying everything from Germany at amazon.de, but can find all my kindle books and my highlights using kindle.amazon.com. Great post, very helpful, thanks! Um… freaking brilliant! Saved me a s–t ton of copy paste. Also like that it capture my notes. And yes, some of us take notes on the Kindle. If I see something and I don’t want to lose the idea, I make an electronic note then and there. Not all of us carry around pen and paper. I have some ebooks that are not showing up on my kindle account because I did not buy them through amazon. How do I get the notes from those books and other pdf files (from university readings) into a word document or a pdf file. That depends. What did you read on – a Kindle, Fire tablet, app, etc? There are special tricks for each option. The apps, for example, will let you share your notes from a book as an email. I’m finding it depends what format the non-Kindle ebook comes in as (I get review copies of business books and like to take notes). I have one that has come in as a PDF and I cannot see the notes in kindle.amazon.com or on iOs. The other has come in as a DOC and I can on ioS! I would like to report that the export to highlights feature is now accessible to the kindle fire hdx without rooting. The latest update 4.5.5.2 I believe has made this possible. I have tested it myself. PDF won’t work on kindle unless you use adobe reader to view and make highlights and export the saved document to your PC. PDF.. EPUB.. They are all completely different formats not handled by Anazon. I am the developer and welcome any input. Pease feel free to let me know if you have any feedback or issues. Thanks Nate! It really helps. There also is a full list of Kindle clippings tool at http://wiki.mobileread.com/wiki/Kindle_Tools_Index#Clippings for your reference, besides of Kindle Mate. FWIW, the Calibre clipping fetch feature is working again in 2.63 for my PW3 — it was broken for me in earlier versions — but Kindle Mate is a much better solution. Do you know if the simplest way (copy text from myclipping.txt to any place you want) works with books not purchased in Amazon? I mean, if I have a epub book, convert it in mobi, highlighted it, and so on… This notes will be recorded in myclipping.txt? Yes, they will be recorded in that file. But you would be better off uploading the ebook to your Kindle account first. That way the annotations would sync across all your devices. My notes/highlights are located on my kindle as “My Clippings.txt”. I found My Clippings.txt by plugging my kindle into my computer via USB. The Formatting of “My Clippings.txt” is pretty bad, so I made a python script that seperates notes by book, and formats everything a bit more nicely. Amazon has a nice web page to view all your notes and highlights. I believe this to be a very nice unadvertised feature. ..Thanks much for all your research! Thanks so much for this. I have been reading books on my Kindle for years and did not know that Amazon had a special place for viewing my highlights and notes. I have a Chromebook so the Bookcision works perfectly. Thanks again! hi! have you ever sent books (pdf files) to kindle by email? So I did it! I like to read it at the e-ink kindle. I have made a lot of notes on it. But for my surprise these files that we send by e-mail to e-reader kindle isnt showing up at other apps kindle or even at the amazon website. The ebooks should show up in the other apps; you just have to download them from inside the apps. And they do show up on the Amazon website – they’re just listed under docs (for personal documents). I dont know what you mean by “download them from the app”. I send them by email to my kindle account. In my e-readed e-ink its showing up and I can read and manke notes, but theyare not showing up in any other device, since amazon or kindle PC. Even when I send it with “convert” in the subject email. Let me see if I can show you where they are hiding. In the Kindle Android app, open the 3-line menu. Scroll down and select the option for “Docs”. That’s where your files should be listed. Anyone here knows how to track books you got on your kindle through other means, ie not through amazon store. Asking for a friend. Pfff. Just use Adnroid/iOS Kindle app. There has export highlights in few taps. Thank you! Didn’t realize all highlights were in the txt file on the kindle. This made my life so much easier! This is mac AppStore app which allows you to export highlights/notes from iBooks, Kindle (as in ‘eInk Kindle connected to computer’), Amazon Kindle Store (as in ‘enter your amazon account and password’). It exports it’s data to markdown file or directly to Evernote. It also wants subscription for any real usage. – You can export notes directly from at least 7th generation or later Kindles, if it is a book bought from Amazon. An email with notes attachment goes to the account email used to register the Kindle. – On Kindle clippings.txt is required only for sideloaded ‘documents’. If you use Send To Kindle to store Personal Documents in cloud, then any notes or highlights created for those on a Kindle can be exported using Kindle app for iOS, Android or Fire (via email client on the device). – clippings.txt contains only those notes and highlights created on that particular Kindle. It won’t have those created on a different Kindle or Kindle app. It’s pretty much useless except for the side-loading use case (which has its following). It is really to be considered a last resort. – read.amazon.com does have all notes and highlights created for books purchased from Amazon (use Search to find the book). If it is Personal Document, then you need to use one of the Kindle mobile apps to export. There’s no export feature on the web site, but it is easy to use copy paste. Someone has probably got a browser extension to export from there. – don’t know what the situation is for the Windows and macOS app – haven’t checked lately. It didn’t for me. I checked with a book I bought from Amazon, and I could see more notes on my Fire tablet than on read.amazon.com. No, I think I was wrong. Nate, can you please share any trick to export highlighted notes in an .epub book which one reads in other non-kindle apps? Readwise uses a browser extension to automatically download your Kindle highlights from the cloud, with no effort required on your part. We also support highlights from side-loaded books and documents through My Clippings.txt. Beyond Kindle, we have integrations with Apple Books, Instapaper, Highly, and Medium (for articles), and a few others. We’re constantly adding more sources. Once synchronized, you can export your highlights in bulk to Evernote or Markdown or you can easily copy one-off highlights for use in writing and elsewhere. Note, however, that downloading and exporting highlights is not our primary purpose: The core of Readwise is that we help you easily and consistently review your highlights, so that you actually get practical use out of them. We do this by resurfacing a “daily review” of your best highlights. What great timing! I was just updating another related post, and your service makes for a great addition. Daniel, does Readwise supports importing highlights from non-Kindle Store books from Amazon(aka ‘Personal Documents’ sent via ‘Send-to-kindle’ ) or only way it’s supported is when book was read on this specific kindle eInk device and ‘upload MyClippings.txt’ was used? Is there way to upload highlights exported from Mantano’s Bookari Reader? This has helped me a lot so I want to give back my experience. I’ve got a recent Paperwhite and I take many notes and highlights as I read books bought primarily through Amazon. I do also read the odd pdf book that I send via email to Kindle using the subject line “convert” so it shows nicely in Kindle format. This is great but I can’t get at the highlights/notes that I make in the pdf books like I can via Amazon for the books I buy from them. So the solution is quite easy: I just plug the Kindle into my Mac and navigate to the Documents/My Clippings.txt on the Kindle and there are all my notes and highlights of all books, including the pdf ones. I can then copy and paste them into my external notes as usual. Thanks for keeping this old post going so long! I’m currently working on Readsmart (https://readsmart.co). You can sync your highlights automatically from Kindle Cloud Reader or you can import all your documents (including pdfs) from your My Clippings.txt file. We believe we can help readers build a repository of knowledge ready to access anywhere, anytime. (to those familiar with the concept, this would be a digital “commonplace book”). What you do with those highlights and notes, is what makes the time reading books worthwhile. I copied a lot of “notes” from CHURCHILL (1104+ pages) to Export from my Kindle to my email. Alas, it seems the file must be too big; I can’t get it to arrive, although it always says “sending”. Anyone know a workaround for this (getting Notes) or what the maximum file-size for export is? My Clippings Manager for Amazon Kindle does exactly this. It will process and categorize your Kindle My Clippings.txt in seconds. All you need to do is to click on a book title and you will see all the clippings of that book in order. You can even set it to skip or include the location and timestamp line.